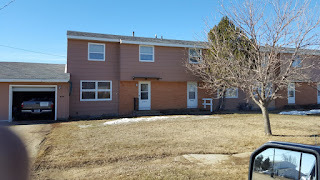 This is a four bedroom and 1 1/2 bath condo in St Marie, MT. The half bath is on the main floor and the full bath is with the four bedrooms. There is a shop located in the backyard that has been used as a welding shop and can be used for a workshop or hobby shop. The backyard is fenced for your dog and would also make a great garden area. Right out your front door is a sportsman’s paradise. Fort Peck Lake, Missouri River, Glasgow and the Dry Lake Unit are all within driving distance. Priced at $25,000. Contact Earl Handy at 760-954-3301. I live in the area so I can show you the unit anytime.